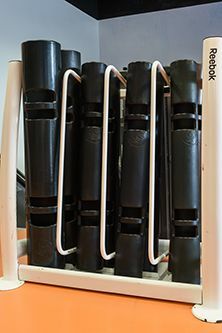 ViPRs, which stands for vitality, performance and reconditioning, are rubber tube-shaped pieces of equipment with handles, which can be integrated in your strength training to add additional functional training and movement. ViPRs allow various movements and rotations throughout training which normal bars do not have. You can perform a variety of exercises using the ViPRs such as shoulder presses, razor curls and hallows.